A train derailment and railcar fire on a rural railroad, such as the accident that occurred on Union Pacific railroad tracks near Graettinger, Iowa at 1:00 a.m. this morning, is relatively risk free compared to a similar disaster where buildings and ignition sources are near the railroad tracks. There is much greater risk of ignition, and there is much greater risk to life and property when the population density is higher near the railroad tracks. Ethanol in an open, rural space resulted in explosions in an Iowa train derailment this morning. 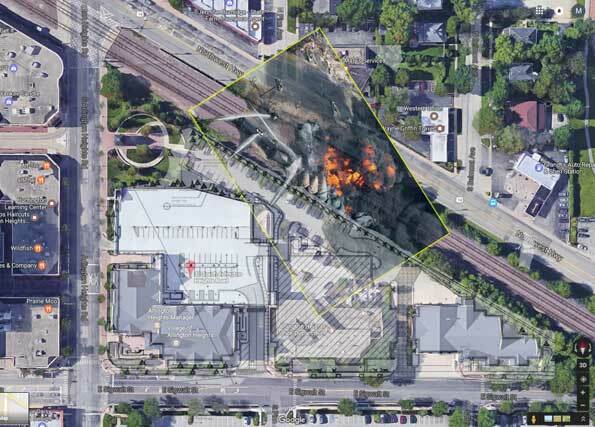 If ethanol vapors in a rail disaster in Arlington Heights collected in the municipal parking garage or the proposed police vehicle garage within 100 feet of the Union Pacific railroad tracks, a more violent and destructive explosion could occur. An ethanol railcar derailment and leak would be more likely to ignite in an environment where buildings and vehicles are near the Union Pacific railroad tracks. Even static sparks can set off an ethanol vapor fire. The Village of Arlington Heights has approved plans to put a $28 million police station adjacent to railroad tracks with its north wall, garage, and underground vaults within 100 feet of the Union Pacific tracks. The decision could have devastating results in the event of a train derailment involving an ethanol leak near the proposed police station. Exposure to non-burning ethanol can cause temporary incapacitation and residual injury. Ethanol vapor is irritating to the eyes, nose and throat. Ethanol can be ignited in almost all ambient temperature conditions. Flashback along an ethanol vapor trail can also occur. Ethanol is normally stable regarding chemical reactivity in air (unless cellulose absorbents or certain other chemicals are involved), but may explode if vapor is ignited after it collects in an enclosed area, such as the municipal parking garage, or the proposed police vehicle garage, or the proposed underground mechanical vault, or a proposed underground stormwater detention vault at the north side of the proposed police station. Historically, most ethanol railcar fires have occurred in rural, open spaces. However, Arlington Heights has increased the risk of a large ethanol explosion by proposing to build along the Union Pacific railroad tracks. The new police station introduces the highest risk on the municipal campus because the police garage and underground vaults are planned to be built very close to the railroad tracks. Ethanol vapors are heavier than air. Leaking ethanol from a railcar could sink down the embankment, enter the police garage, collect in the enclosed space, and ignite from a vehicle spark, garage door opener spark, switch spark, static spark, or cigarette, etc. Leaking ethanol could also collect in the proposed underground stormwater detention vault, which could hasten ethanol flow into the stormwater sewer system. If permeable walls are used for the proposed detention basin, ethanol could permeate underground into the soil, requiring extensive excavation for cleanup. Ethanol could be highly reactive with other chemicals in case of mixture with leaks from other specific chemicals from another railcar. Ethanol reacts violently with acetyl chloride and acetyl bromide. Also, mixtures with concentrated sulfuric acid and strong hydrogen peroxide can cause explosions. Mixtures with concentrated hydrogen peroxide also form powerful explosives. Ethanol reacts readily with hypochlorous acid and with chlorine to give ethyl hypochlorite, which decomposes in the cold and explodes on exposure to sunlight or heat. Ethanol reacts with isocyanates with explosive violence. Isocyanate was the chemical type involved in the Northwest Highway truck crash Hazmat in Barrington this week. In the event of a railroad crash, derailment, or leak; firefighters have to act fast to identify and isolate chemicals — hopefully before ignition occurs. Firefighters are especially concerned about ignition, fires, and release of toxic inhalation gases that could kill many people. In an ethanol-only incident, firefighters would mostly be concerned about preventing ignition, and cooling non-involved rail cars when some are already burning. ELIMINATE all ignition sources (no smoking, flares, sparks or flames in immediate area). All equipment used when handling the product must be grounded. Do not touch or walk through spilled material. Stop leak if you can do it without risk. Prevent entry into waterways, sewers, basements or confined areas. A vapor-suppressing foam may be used to reduce vapors. Absorb or cover with dry earth, sand or other non-combustible material and transfer to containers. Use clean, non-sparking tools to collect absorbed material. LARGE SPILL: Dike far ahead of liquid spill for later disposal. Water spray may reduce vapor, but may not prevent ignition in closed spaces. Small spills or leaks are immediately isolated 150 feet in all directions. This would necessitate evacuation of the proposed police station site. The proximity of the police station with the site of the spill would cause a race with the clock to prevent ethanol from leaking into basements and underground vaults. Large spills necessitate evacuation of people 1,000 feet downwind. In case of fires involving rail cars with ethanol, evacuation is necessary for a radius of one-half mile in all directions. Remember, a fire would be more likely to ignite because of the proximity of the police station garage and any nearby mechanical vaults or building HVAC or mechanical systems with spark-like ignition sources. Small fires are fought with dry chemical, CO2, water spray or alcohol resistant foam. Note that the parking area to the north of the police station received a variance for narrow aisles, and there is some concern that fire vehicles, especially the ladder truck cannot maneuver well in the narrow parking lot. Difficult maneuverability of fire vehicles near the railcar ethanol leak could cause delay in isolation of the ethanol. Delay of ethanol isolation could increase the risk of ignition; and once ignition occurs, the ignition becomes a major rail disaster with the need for major evacuation. Evacuation would be necessary up to Hawthorne Street to the north, throughout all of Recreation Park, throughout all of downtown Arlington Heights as far west as Mitchell Avenue, throughout the Scarsdale neighborhood just past Park Street to the south, and as far Derbyshire in the Stonegate neighborhood — including Mariano’s and Walgreens to the east. Imagine how evacuation could be hampered if most of the police vehicles at the back of the police station were parked in a pool of ethanol. Proposed police station (diagonal hash mark) overlayed with train disaster scenario on satellite view of Village Hall, police station and fire station site. If the fire involves rail cars, firefighters need to fight the fire from the maximum distance that the water fog will reach the burning cars. Otherwise, they must use unmanned hose holders and nozzles. In many cases firefighters must retreat and let the rail cars burn. The density of buildings on the municipal campus would make it difficult for firefighters to spray a fog of water on the burning rail cars from a maximum distance because of building obstructions. The building obstructions could also make it difficult to see what is burning, or what needs to be cooled down. If a fire involving the rail cars needed to be left to burn, the $28 million police station could be totally consumed by fire and destroyed. The Cardinal Are New Arlington Heights Police Station Planning Standards Held to the Same Scrutiny as Mom & Pop Businesses? CAMEO is a system of software applications tools developed by the EPA’s Office of Emergency Management (OEM) and the National Oceanic and Atmospheric Administration Office of Response and Restoration (NOAA). CAMEO is used to model scenarios regarding spills, fires and weather conditions to assist front-line chemical emergency planners and responders.